The famous, nearly universally loved crepe is a simple and delicious food that is served worldwide from street vendors to high-end restaurants. Crepes primarily come in two forms — sweet or savory. 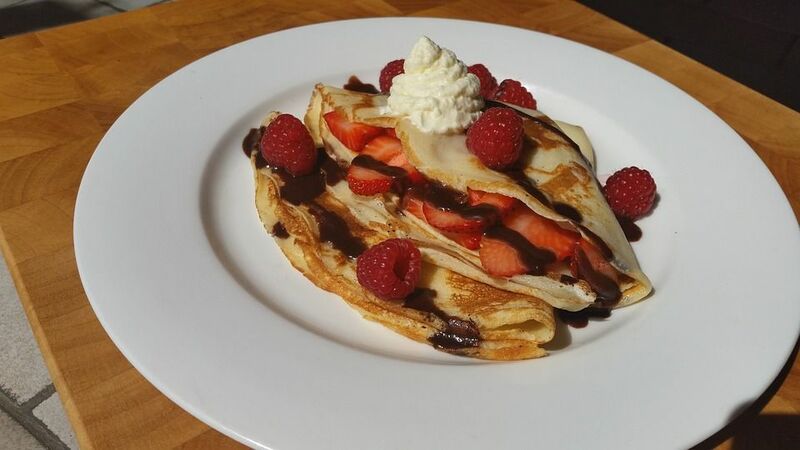 Savory crepes can be filled with hearty foods like meats, cheese, vegetables and eggs, or they can be sweet and filled with tasty treats like Nutella, bananas and strawberries. 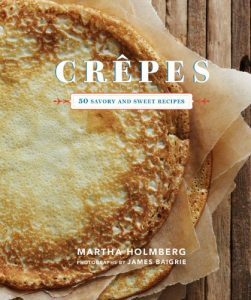 Crepes are a versatile food that is light, easy to cook and convenient. They are like a thinner, less fluffier version of a pancake. 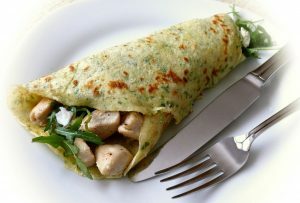 With the right crepe pan and ingredients, crepes can be a quick, easy and healthy meal. There are two common ways to go about cooking crepes. You can either cook them in a crepe pan or use a crepe maker/griddle. Crepe maker — Specialized equipment and usually a bit more expensive than crepe pans. Crepe makers are probably overkill unless you are making crepes regularly or are planning to use it to make lots of crepes for an event of some sort. 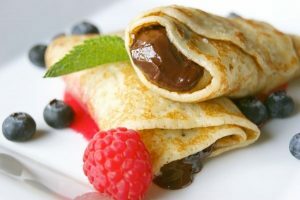 They are durable and provide consistent heat distribution which is very important for uniform crepes. They are simple to use and don’t require a stove to heat a pan; simply plug them into an electrical outlet and add a bit of butter or oil to start cooking. You can also make any other breakfast food on them such a pancakes or eggs. Most crepe makers aren’t too big but usually have a 12 inch diameter cooking surface. They are portable and easy to clean which makes them great for events. Just let them cool afterwards and wipe them down with a clean rag. Crepe pan — These are kitchen pans meant to be used over a stove. The primary difference between a normal kitchen frying pan and a crepe pan is that their rims/sides are shallower. 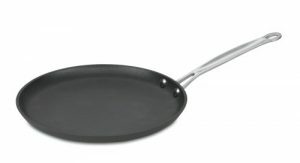 The metal is also usually thinner than a normal frying pan and the bottom flatter to get an even cooking heat. Crepe pans most commonly come with diameters of 8, 10 or 12 inches. We find about 10 inches to be the optimal size for making crepes at home. Any larger or smaller and your crepes will be just that — too large or too small. The pan’s diameter takes into account the rim/edge of the pan, so a 10 inch pan will make an 8 or 9 inch crepe depending on the size of the rim. You must also take into account what type of metal you want in your crepe pan and how much maintenance you’re willing to do. 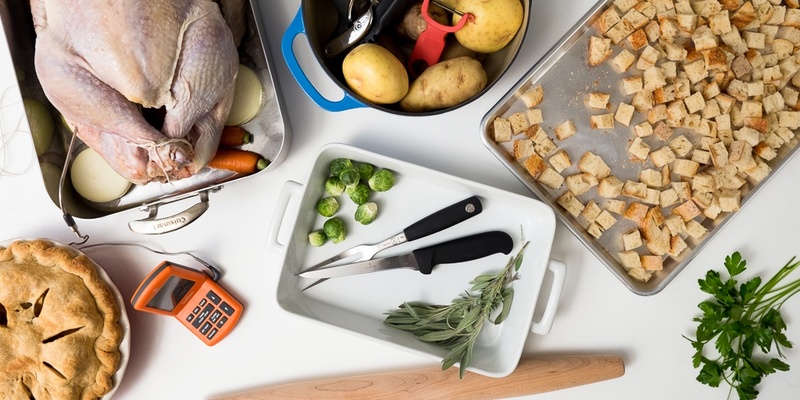 Most cooking pans will come in anodized aluminum, cast iron, ceramic or copper. Unlike a crepe maker/griddle, you also don’t need to purchase a batter spreader. Just shake the cooking pan while adding the batter and let it spread. Crepe pans are also great for cooking other types of pancakes and breakfast food and anything that doesn’t require a taller rim. Aluminum: The 10 inch Cuisinart 623-24 non-stick crepe pan is one of the most popular crepe pans you can buy and is our top choice. This particular crepe pan excels in every area — excellent and durable non-stick surface, no hot spots, handle doesn’t overheat and consistently turns out perfectly uniform crepes. 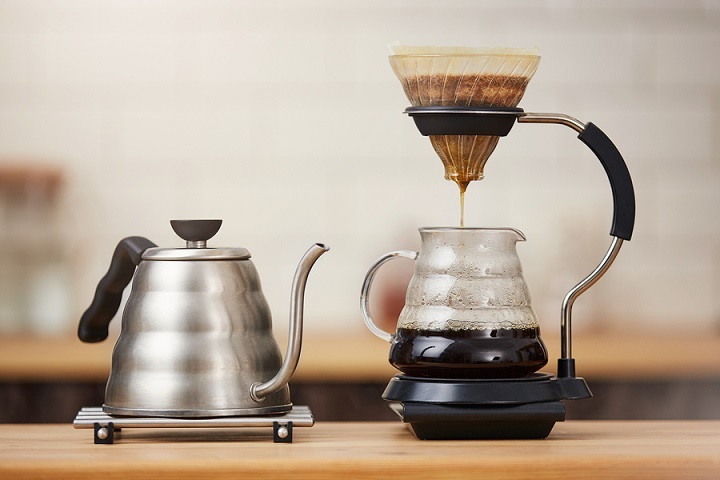 Its patented nonstick surface is coated with titanium for easy maintenance and a hard anodized aluminum exterior that is non-porous and highly durable. 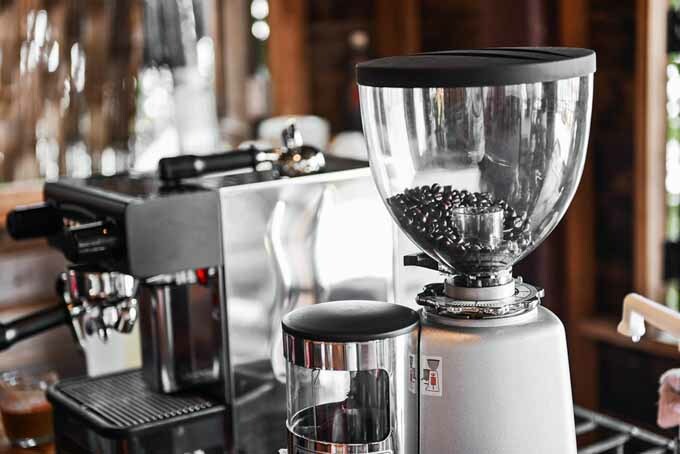 The handle itself is stainless steel and has a strong grip without transferring much heat. This pan is also oven safe for up to 500 Fahrenheit. The wall thickness and size of this pan is also perfect for crepes. No need to spray any oil as the non-stick works great. The rim of this pan has a smooth upward curved edge that works well with batter. For the price, this crepe pan provides the best value we could find. Cast iron: If you’re a true lover of cast iron cookware, we recommend the Le Creuset enameled cast iron 10-2/3 inch crepe pan. We won’t go into specific maintenance details about cast iron cookware here, so only purchase one if you know how to properly care for them and season them. A cast iron crepe pan will last forever and is a great pan that you can pass down to your children. The Le Creuset crepe pan we recommend is a particularly well-designed one. 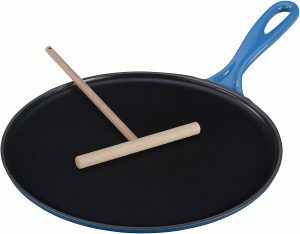 It is a French-inspired crepe pan with a black enamel cooking surface and a colorful exterior. The nicely designed handle keeps the heat away. The rim on this pan is shorter and shallower compared to other pans and the diameter is larger at 10 2/3 inches. You’ll make perfectly round large crepes every time. Ceramic: Not too many companies make ceramic pans, but look no further than the French-made 9.75 inch Matfer Bourgeat 676125 classic ceramic crepe pan. The body of these are actually anodized aluminum, but the cooking surface is a non-stick ceramic enamel that is PTFE (Teflon) and PFOA free. The total wall thickness of the pan is 3mm with a flat stainless steel handle. This pan also has a French hook for hanging the pan when not in use. 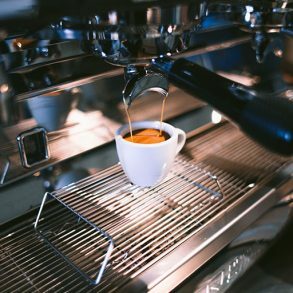 Why a ceramic coating? Compared to other materials it is more environmentally friendly and doesn’t have any PTFE and PFOA chemicals. Ceramic is also scratch and abrasion resistant, durable and doesn’t corrode. However you will want to use wooden, plastic or silicone utensils when cooking to prevent scratching the ceramic non-stick coating. Be warned though that there are claims that ceramic non-stick coatings will only last about a year. 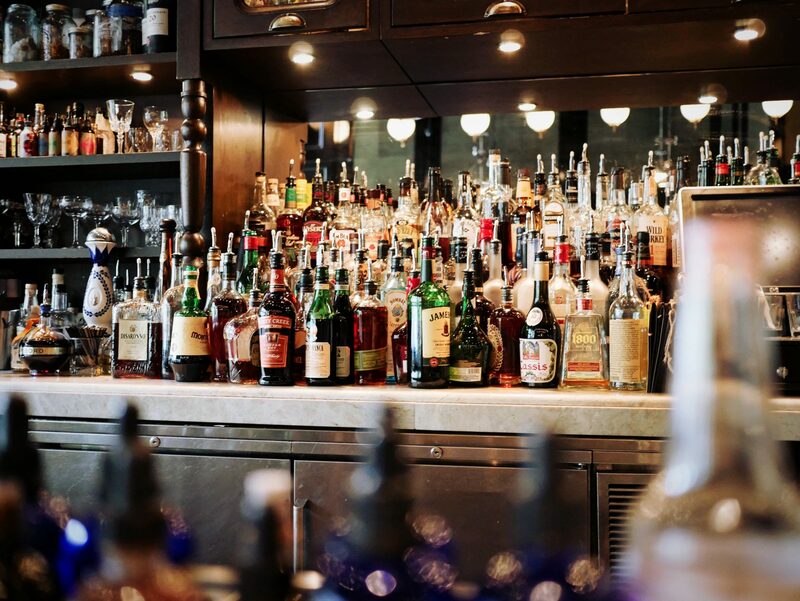 Copper: Why choose a copper pan over other types of materials? The main reason is its excellent thermal conductivity which allows for a consistent and even heat without hot spots. 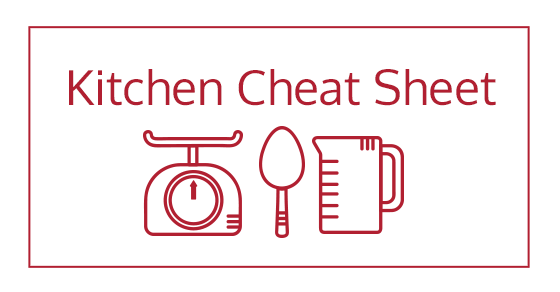 This is particularly important when cooking crepes so one area doesn’t cook faster than another. An issue with thin crepe pans is that they heat up quickly but can have uneven heat distribution. One way to solve this is to have a pan with a copper exterior. 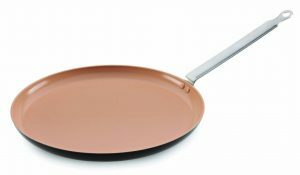 The best copper crepe pan we could find is the French Mauviel 12 inch copper crepe pan. The exterior is 2 mm of copper that allows the pan to heat quickly, evenly and efficiently. A high quality copper pan like this also has a non-reactive stainless steel lining which prevents the copper from reacting with acidic or alkaline foods. The pan itself is a bit heavy but its cooking performance can’t be beat. The bronze handle looks beautiful and the sides are shallow and angled inwards. The handle itself has a bit of a problem with getting too hot and being a bit too thin for the pan’s weight. We would suggest picking up this silicone pan handle that resolves any heat and comfort issues with the bronze handle. Mauviel also offers a limited lifetime warranty against defects and stands by the quality of their cookware. 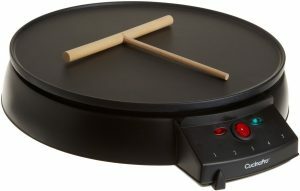 If you are regularly making crepes at home or for special events, then a dedicated crepe maker/griddle is really useful. The best crepe maker we found is the CucinaPro non-stick Crepe Maker. With this machine, making crepes is easy and fast. The edges are raised slightly so the batter doesn’t spill out. Some people prefer a completely flat griddle so its easier to remove the crepes, but we found avoiding batter spills far outweighs any benefits from a completely flat griddle. Once you turn it on, it heats up quickly with the light indicating when the specified temperature has been reached. 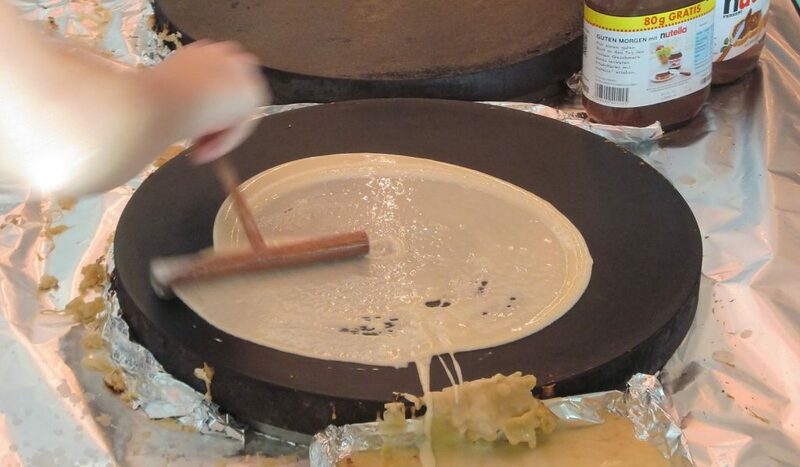 The diameter is 12 inches allowing you to make large traditional French crepes, but you can make any size you like using the batter spreader that comes with it. It has five different temperature settings, but if you prefer to cook crepes quickly, we suggest using the level 4 heat setting. You will need to do a bit of experimenting with the temperature settings depending on your batter, what ingredients you’re adding and how crispy you want your crepe to be. Start the heat at just under 2 when first beginning to make crepes until you can get a handle on it. If you’re making a lot of crepes it’s also useful to keep a bowl of water around to keep the spreader clean. We found the temperature to be very stable and consistent without any hot spots making crepes with perfectly uniform color. Just like with crepe pans, this griddle is also great for making breakfast food and even quesadillas. Cleaning is also really easily. Let it cool then wipe it down with a napkin or washcloth. This crepe maker also comes with a book that has a number of tasty crepe recipes that work well with this particular crepe maker. There aren’t too many extra crepe making accessories that you can buy, but we suggest a crepe spreader and spatula set. These usually include a 3.5, 7.5 and 14 inch batter spreader and a 14 inch spatula for flipping and removing crepes. 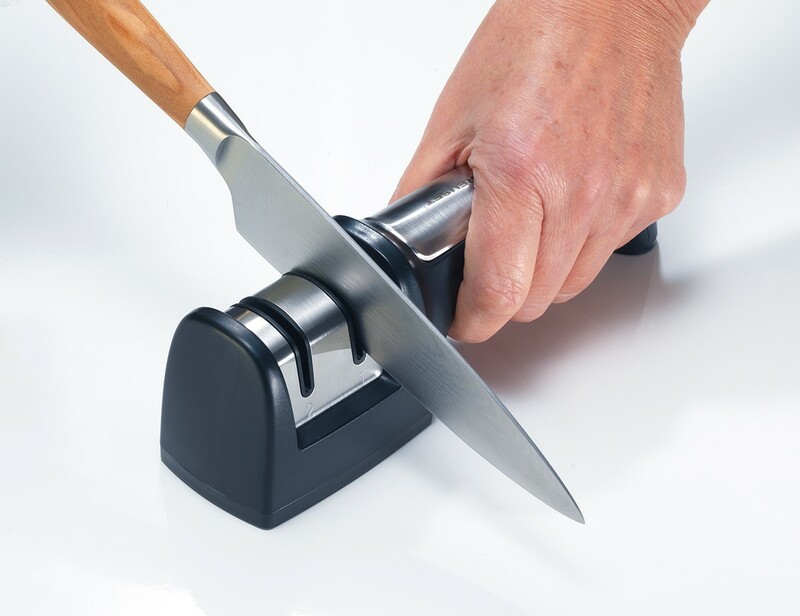 If you want an all-in-one solution, we recommend the Sabatier crepe turner. 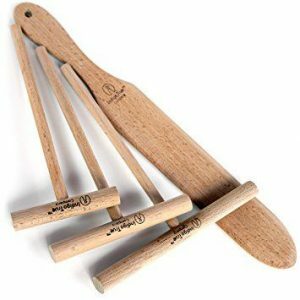 This nicely constructed piece of woodwork has a tapered edge for spreading batter which you can also use to flip and remove your finished crepes or pancakes. It has a natural oil finish and won’t scratch your non-stick surfaces, enamels or ceramic. One tip for using batter spreaders it to lightly use the spreader and let it float on the surface while moving it around. If you don’t have access to a batter spreader you can also use the back of a table spoon. When using batter spreaders we suggest holding your hand lower on the handle and spread outwards in a circular motion. 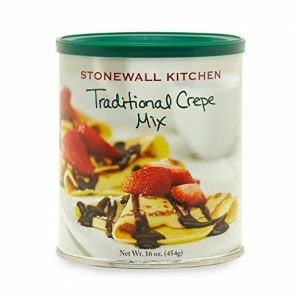 One of the tastiest crepe mixes we’ve come across is the Stonewall Kitchen traditional crepe mix (16 ounces). It has a buttery and light flavor with a excellent consistency. Just make sure you mix it really well or strain it to remove any lumps in the batter. And if you want something sweet, you can never go wrong with adding a bit of delicious Nutella. For cleaning your griddle, we suggest picking up a griddle screen. 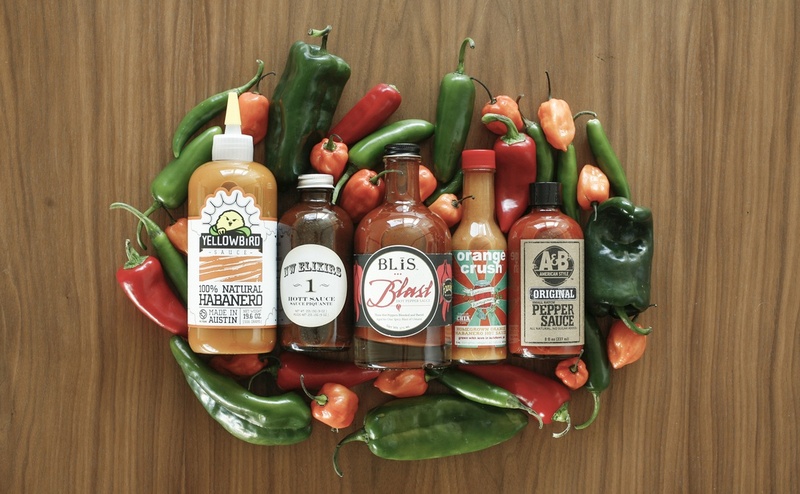 It will bring any well-used griddle back to life.